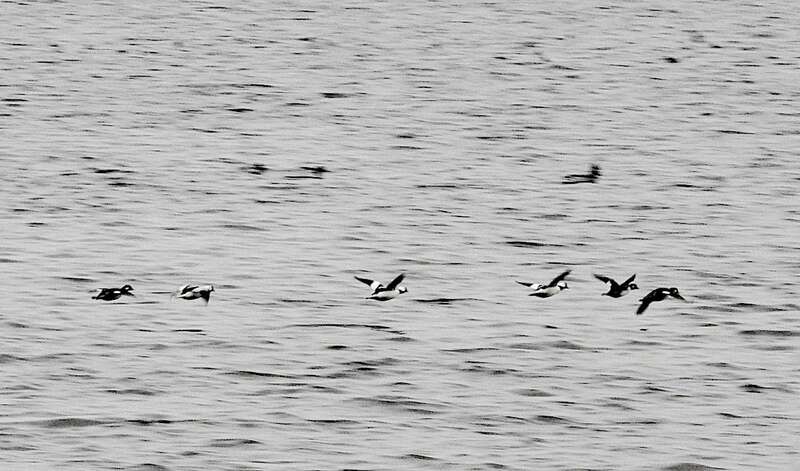 Six buffleheads flying, Madison, Wis, Nov. 12, 2017. Hopefully this won’t be the last of my bufflehead photos. Why are buffleheads called buffleheads? “Buffle” is derived from buffalo; the name refers to the duck’s large, bulbous head. (American buffalos have ginormous heads.) The male’s head looks especially big because of contrasting white coloring on his crown. When he puffs out these headfeathers, it looks gargantuan. Guess what? The bufflehead’s genus name means almost the same thing! Bucephala is a Latinized version of the Ancient Greek boukephalos, which means “bull-headed” (bous=bull, kephale= head). The species name, albeola, comes from the Latin for “white” and refers to the white markings on both males and females—although males have a higher proportion of white to black in their overall coloration. Buffleheads share the Bucephala genus with goldeneyes. Read about other (better photographed) birds.